Get the best odds for our BTTS Tips with Betfair! Make sure you’re using Betfair for these tips or lose out on potential winnings. A £30 stake on this BTTS bet returns £161 with Betfair – using any other site will lose you money! Enjoy our tips? Sign Up to Football Bet Profit’s Email List to get all our tips direct in your email every day for just a one off payment of £10! BTTS or both teams to score tips are our second most popular predictions after our football accumulator tips. We also have BTTS and Win tips which have great odds and our latest offering of over 2.5 goals tips. Follow Our BTTS Predictions – We have an amazing profit record. Look for Fixture Patterns – Some fixtures almost guarantee goals. Pick Top Teams Away – Big teams playing away from home is a good BTTS indicator. BTTS Stats – Certain team’s games end up with both teams scoring more than others. Take Advantage of Offers – Every site offers free bets and offers for BTTS bets. Use Acca Insurance – Get money back on near misses. Think Long Term – Don’t chase losses or try to get rich quick. We’re well known for our football accumulator tips here at Football Bet Profit but our BTTS tips are a great way to make profit. BTTS, or both teams to score accumulators work in the same way as standard match result accumulators in that you choose multiple selections and need them all to win for the bet to be successful. BTTS predictions need to be made differently though as it doesn’t matter who you think is going to win the game, it’s all about whether or not both teams will score. Read on for our guide to making a both teams to score prediction and the team recommended for maximum chance of making profit. Fixtures: Certain fixtures have a reputation for both teams to score, for example the El Classico in Spain almost always sees both teams scoring. Look at the history of the fixture and if both teams score more often that not then it could be worth adding it to your accumulator. Styles of Play: Certain teams play in a style that encourage both teams to score by throwing men forward and trying to outscore the opposition – leaving them open at the back. A perfect example of this is Liverpool under Jurgen Klopp. They are scoring plenty of goals by playing attacking football but leave themselves vulnerable at the back and concede in most games. Teams Playing Away from Home: A big team playing away from home is often a good indicator that both teams will score. A team like Barca will obviously be looking to win the game but their opponents are more likely to score with their home advantage. Look for teams that would be expected to win away from home, especially if they face attacking competition and you should find both teams scoring! What is a BTTS bet? A BTTS bet is betting on both teams to score in a single game, regardless of the final result or how the goals are scored. BTTS betting is one of the simplest types of bet and therefore a great opportunity to make profit. For our both teams to score tips, we combine multiple BTTS games to make an accumulator, often producing large odds for highly likely outcomes. Another popular variety is a BTTS and Win bet, in which you stake on both teams scoring as well as the result of the match. This can result in some huge odds and is a great option for longshot accumulators. What Site Should I Use to Place These Both Teams to Score Tips? We highly recommend that you use Betfair for your Both Teams to Score Accumulators. Our BTTS tips often include ‘lower’ leagues or foreign tournaments where goals are highly likely. Betfair have odds available on a huge range of leagues and games. Some of the games we tip might not be available on other sites so we recommend having a Betfair account if you’re getting on our bets. Betfair are one of the most popular bookmakers around so you probably already have an account with them. If you don’t use Betfair for your BTTS bets then you’re really missing out. How likely is it for Both Teams to Score? Statistics show that both teams score in a rough average of 50% to 60% of games and this average is higher in certain leagues. The Spanish Primera and the English Premier League are two of the most common leagues where both teams score as well as lesser known leagues like Switzerland and Australia. Based on these statistics, if you see odds of evens or greater on both teams to score then it probably offers good value. 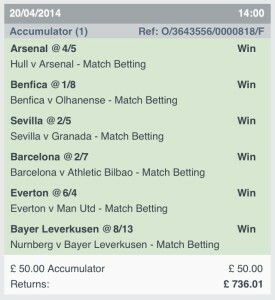 Do BTTS Accumulators work with Offers like Acca Insurance? An important part of making profit from our BTTS tips is taking advantage from betting offers. Each site has different offers that you can use like acca insurance or odds guarantees which we always use on our football accumulators. Most of these offers don’t work with both teams to score accumulators, however William Hill’s Acca Five and Betfair’s Acca Edge do apply to BTTS bets. This means it’s more important than ever to choose the site with the best offers when you’re placing BTTS Accumulators. Which Offers Do Work with BTTS Tips? William Hill Acca Five – This is probably the best offer to use with your football accumulator tips BTTS as it gets you your money back as a free bet if your bet only loses by 1. With the bit of luck required for BTTS accumulators, this insurance can really help you make profit long term. Read more about Acca Five. Betfair Acca Edge – Betfair’s Acca Edge is a variation of Acca Insurance which gets you your money back in cash rather than a free bet but you do have to accept a slight reduction of odds when you place the bet. There’s no maximum refund on Acca Edge so we recommend using it if you’re placing bigger stakes on our both teams to score tips. Read more about Betfair Acca Edge. 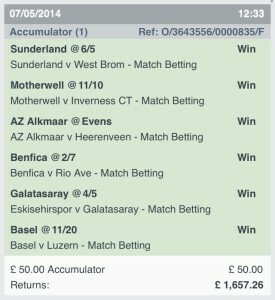 Want to win bets like this with us? Join in with our both teams to score tips today or check out all of our football betting tips including the popular both teams to score and win accumulators!